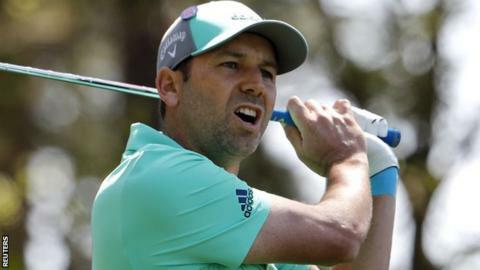 bbc.comDefending champion Sergio Garcia put five shots into the water for a 13 on the 15th in round one at the Masters.The Spaniard equalled the worst score for a hole in the tournament's history and carded a nine-over-par 81.Four-time champion Tiger Woods returned to Augusta with a one-over-par opening round of 73 on Thursday. Henrik Stenson, on his 42nd birthday, is the clubhouse leader with Americans Patrick Reed and Charley Hoffman and Canadian Adam Hadwin at three under. Northern Ireland's Rory McIlroy, Justin Rose of England and world number one Dustin Johnson are among the later starters. Garcia was two over when he teed off on the par-five 15th but his third shot, a short pitch over the water guarding the green, landed near the hole and span back, trickling down the steep slope. Garcia plummeted to only one place off the bottom of the leaderboardThe 38-year-old attempted virtually the same style of flighted shot on each subsequent occasion, before finally getting one to stay on the green - but his one-putt for a 13 equalled Tom Weiskopf in 1980 on the par-three 12th and Japan's Tommy Nakajima on the par-five 13th in 1978. "I don't know what to tell you," said Garcia. "It's the first time in my career where I make a 13 without missing a shot. Simple as that. "I felt like I hit a lot of good shots and unfortunately the ball just didn't want to stop. I don't know, it's just one of those things. So it's just unfortunate, but that's what it is. "To the delight of the sympathetic crowd, Garcia birdied the next hole but the world number nine cut a dazed figure as he completed his round. American Woods, joint second and tied fifth in his most recent PGA Tour events last month, has only broken 70 once in 21 opening rounds at the Masters.With clear blue skies and benign breezes at the legendary 7,435-yard course, he holed from seven feet to birdie the third - but found bunkers at the next two holes to drop consecutive shots.Another shot went at the 11th after a pushed tee shot and he needed to hole a putt from the fringe at the 12th to only drop one stroke after his tee shot trickled into Rae's Creek.The 42-year-old world number 103, playing in the event for the first time since 2015, had two birdies in the last five holes in the Georgia sunshine.After his first round at the Masters for 1,089 days, he said: "It feels great to be back, it's been a while. I was looking forward to grinding it out and I made a little comeback on the back nine to get myself back into this tournament. "Australian Marc Leishman, the 34-year-old world number 16 playing with Woods and Englishman Tommy Fleetwood, birdied two of the first three holes and held the lead at four under before he chipped into the water at the 15th and made a double bogey - finishing with a two-under 70.special guide.